RTSH are currently working on the shortlist of the songs and artists that will compete in the upcoming Festivali i Këngës—the Albanian national selection. As we wait for the Albanians to reveal their shortlist. I’m sure you are all dreaming about the acts we’d like to hear sing for Albania at Eurovision 2015. What Albanian artist pops into my head? Elhaida Dani! When she was just 16 years old, she entered the talent show Star Academy and won! She took her 15 minutes and ran with it, winning several song competitions in her home country and abroad. I was introduced to this precocious talent when she entered the 50th annual Festivali i Këngës in 2011. She debuted with the ballad Mijëra vjet, which, unfortunately, failed to sway the Albanian jury members. She didn’t get any points from them. Sad. But she was only 18 years old at the time and, despite the very classy performance, she did need a stronger song. Elhaida Dani performed at Festivali i Këngës 52 as a guest performer. In 2012, Elhaida covered the Albanian 2012 Eurovision entry Suus at a festival in Romania. What a performance! At the age of 19 she brought magic to an already magical song. Dramatic, emotional and sophisticated! Don’t forget she sang Rona’s song live. Elhaida Dani performed Suus live at a festival in Romania. In 2012, Elhaida entered the major music festival Top Fest with the song S’je më and—no surprise here— she won it. Elhaida performing at Top Fest 2012. In 2013, Elhaida entered the first season of The Voice of Italy. It was a very emotional time for Elhaida’s parents, as their 19-year-old won the show, giving her an even bigger platform on which to build her career. With all the success of winning the first edition of The Voice of Italy, Elhaida released a pop song called Baciami e basta. Elhaida displays her lovely unique voice in her very first Italian single at the age of 20. She’s a superstar in the making! I’m afraid not. Eurovision is not popular in the Land of Eagles, but Elhaida Dani could give it fresh appeal. Who wouldn’t love this amazing young talent? I hope that Elhaida has entered a song for Festivali i Këngës 53 as I can see her taking the Festival i Këngës trophy and representing Albania in Vienna for the 60th anniversary. I believe Elhaida Dani has got what it takes to win the Eurovision Song Contest and give Albania its first win. Roll on, Elhaida! Would you like to see Elhaida Dani representing Albania in the future? 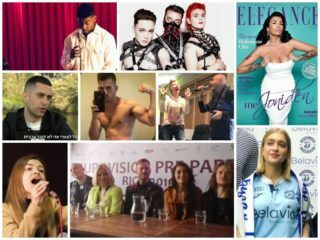 Are Luxembourg And San Marino About to Join Forces With A Historic Eurovision Collaboration? I just heard her song choice and I am glad it is in English since the message I got from the video is that no matter what “Women count in this world, and for that I am eternally grateful!” Beautiful Song and a very Beautiful woman! Good Luck to all entrants in this year’s ESC! Take Care all! I like Albania’s entry a lot. It is a nice song with a lovely voice to sing it. Just please don’t make last year’s mistake and don’t translate it to English. Great song and singer !! Well done Albania !!! Good Luck in Vienna !!! Can anybody put the lyrics of the song on this site, please ?? Thank you in advance !!! She won in Albania. You were right! @Xepher we have written an article about who will be participating in Festivali i Këngës 🙂 And yes she is on the list! YES PLEASE!!!!!!!!!!!!!!!!!!!!!!!!!!!!!!!!!!! I would literally be so happy if Elhaida represents Albania in Vienna! Tirana 2016? Maybe! I’m in the minority who actually liked Identiet for some reason (I have no idea why I like it), and I loved One Night’s Anger…yet absolutely hated Suus? Basically, I would LOVE Albania to make it to the final again in Vienna! I hope she does represent by the sound of these videos on here, she’s great! She should enter FiK 53. I’ll love to hear what her song will sound like. Arilena could definitely win ESC for Albania, so could Miriam Cani, Besa, and Blerina Braka.